Another financial crisis data point flashback. A Bank of America Merrill Lynch survey shows the same results as 10 years ago, as a sustained economic boom winds down and cyclical recession dawns. Summarizing, investors were largely correct in describing the state of the global economy in the years leading up to the recession. They began to believe the economy had moved into late-cycle by 2005, a couple of years before the recession struck in December 2007. By late 2008, they began to understand the economy was in recession, and by mid-2009, they understood the economy was early-cycle, which occurs after recessions. Furthermore, investors seem to firmly grasp the sequence of the phases of the business cycle, as evidenced by the sequential peaks in the black, red, green, and blue lines during the period of 2007-2012. 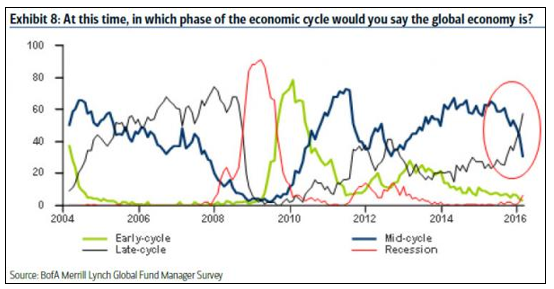 That is, it makes sense that a peak in late-cycle would be followed by a recession, which would be followed by early-cycle and then mid-cycle.